This isn't the usual thing I blog about but since I've only seen this on Lillian's blog, I thought I'd also do a quick post. 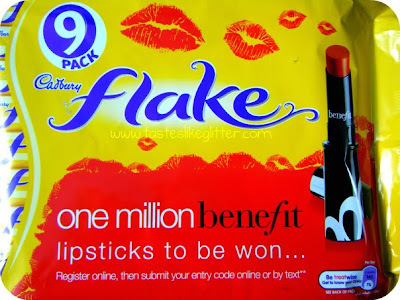 If you haven't already heard/seen/read, Benefit have teamed up with Flake to give away one million lipsticks/glosses. If you buy a promotional Flake (single/multipack) between 11 February and 31 October 2010 you will find a code on the inside of the wrapper. To see if it's a winner you just have to go online and enter it. You have to quickly register the first time but it only takes a minute. Full terms and conditions are here. Will you be trying your luck?